The Obama administration has given a fresh explanation to justify its secret deal with the Taliban to exchange five Guantanamo Bay detainees for Bowe Bergdahl: the radical Islamists who held the Army sergeant would execute him if the terms of the exchange were made public before the handover was carried out. BRIAN WILLIAMS, anchor, from Normandy: Just tonight it now appears the White House is changing its story. JIM MIKLASZEWSKI: The White House today came up with still another story line, that President Obama could not tell key members of Congress about the prisoner swap in advance because, if it leaked out, the Taliban would kill Bergdahl. But the white house did inform democratic senator harry Reid the day before Bergdahl was freed. 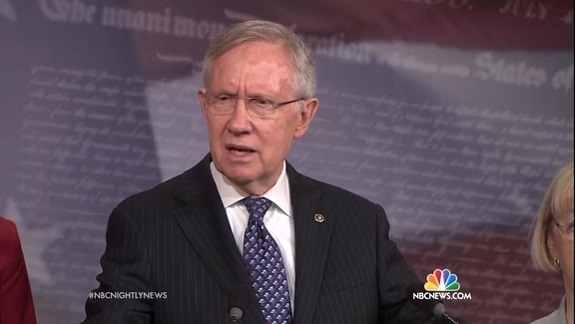 Sen. HARRY REID (D-Nevada): So they've made a big deal over nothing. The whole deal is, is it Friday or Saturday? What difference does it make? You know, what difference does it make? MIKLASZEWSKI: The Taliban meanwhile claims that handing over Bergdahl in exchange for five Taliban prisoners has handed them a victory over America. Two Taliban leaders involved in the swap told Time magazine the Taliban now has a newfound status. ARYN BAKER, Time magazine Middle East bureau chief: So they see that, or they see that that makes them on equal footing with the Americans. That gives them the legitimacy that they have been seeking since 2001. MIKLASZEWSKI: And, they say, provides an incentive to kidnap more Americans. BAKER: If you can capture one American soldier, you can get four [sic] of your guys. So this was a good deal and everybody's going to be doing the same. In the very next story in the broadcast, NBC's chief White House correspondent Chuck Todd noted that no one has "heard a clear explanation from aides traveling with the president about why the White House story changed today other than chalking it up to media leaks." Nonetheless, he noted, "the president himself is standing firm behind every part of his decision including keeping Congress out of the loop." For his part, CBS's Bill Plante briefly relayed how, "Bergdahl's health was the administration's initial reason for expediting the mission and not telling Congress, but when angry senators were briefed yesterday, they were also told that the White House had to move quickly because of death threats from the Taliban if word of the deal got out. Plante failed to display any curiosity as to why that fact was left out of the administration's initial talking points. Plante also failed to note that Reid had been told of the special operations mission to retrieve Bergdahl prior to that mission's execution. Meanwhile on the June 5 edition of ABC's World News, chief global affairs correspondent Martha Raddatz completely failed to note the shift in the White Houses's rationale, although to her credit she did cite Time magazine's reporting that a "senior Taliban commander" was gloating that in light of the prisoner swap, "the deal for Bergdahl would 'definitely' encourage them to try to kidnap others. "Now everybody will work hard to capture such an important bird... like Bergdahl," Raddatz quoted the Islamist extremist.